X-FACTOR – Hypnosis News From U.K. Check out Dave Rawsons Website here – http://stagehypnotist.jigsy.com/ I gather there are pictures of Rylan Clark on his website also taking part in the show. For the record Dave Rawson is a top bloke and one of the few Comedy Stage Hypnotists in England that I would personally reccommend to anyone looking for top class entertainment. In the above video Rylan is the person on the far left hand side as you watch the video. In this short video The subjects have been told they can have money (in shape of a toilet roll) if they tell me who has been making faces. Watch where one women puts her money and watch me laughing so much at it. Well Done to Derren Brown, Anthony Owen & all the team at Objective Productions on a great show last night, examining the power of The Placebo Effect. For those who did not see the show be sure to check it out either on 4OD or You-Tube, as Derren using PLACEBO and I would also argue some Off Camera Hypnosis (Which is just another powerful ritualistic Placebo anyway) he became a strange cross between Self Help Hypnotist Paul McKenna and Celebrity Life Coaches The Speakmans as he helped people to Quit Smoking, Overcome their Fears and Phobias and even to Eliminate Allergies and Skin Conditons from their life with ease! It was a great show, and it was great to see that Derrens experience and thoughts on the Placebo effect and its power, match those that I have been teaching for years at my events. I’m Proud and Privileged to know that Objective Television Productions, have over the years purchased many of my training DVDS and on several occasions now, have used ideas, material and such from them in their shows. Very much looking forward to his show next week on how Religion and God are Placebo effects, I wonder if it will agree with the views in my “The Bible God & Hypnotism” Package? For just £37 – You Get Numerous DVDS and Many hours of step by step video training in everything you’ll ever need to know about Hypnosis and therefore also the Placebo Effect. There is a solid 45 minute routine (1st half of show) and also an even more amazing 75 Minute routine (2nd half of the show). Also there are some extra Mentalism Routines included which together can Easily provide another stand alone 60 minutes of material. And of course all of the items could be used as individual routines on their own In their own right, and many of the props and gimmicks can of course be used To perform numerous other Mentalism and Mind Magic Routines. *Ashleighs DVD Book Test = This is Royles Adaptation and Expansion on “The Red Carpet” by Jason Palter and Ari Soroka which enables you to do far more than the prop which inspired it. You get the Black Hood for over your head which is actually an examinable Bag Blindfold that could be used in other routines, the Specially gimmicked Full Colour DVD Book, The Coloured childrens number cards in tin, a small soft toy for randomly selecting volunteers, the Shrek Rubber Mask for Ending (Other endings are also possible with easily available rubber masks), All music needed and master copies of the book which you could print out to make more DVD Books if you so desired. The Red carpet which does not enable as much of a routine as this is no longer available and when it comes up sells for around £100 to £150 Second-hand. You get way more with this prop so the realistic amount it would cost is – (Value £150). Additional Items You Get Needed For Show or Travelling it. (c) 1975 – Now Out Of Print, Rare and Hard To Obtain. This is an amazing well put together Book test for the Mentalist or Mind Magician. Effect One = The Mentalist writes down a single word. A volunteer opens the bookanywhere at random and then turns forward or back to find the start of a chapter. They then select in a random manner a word from that randomly chosen page, it turns out to be the word that you wrote down as your prediction. Effect Two = You write a different prediction. A page is randomly selected from the book and then another volunteer selects a number between 1 and ten. That paragraph is counted to by the volunteer starting from either the left or right hand side of the page. When that paragraph is found a word from it is selected in a random looking manner. This word proves to be the same as the one you wrote down and predicted. Effect Three = The book is handed to someone and they think of a number between 1 and ten. without saying a word they are told to turn to the chapter of that number and look at the last word in that chapter. This turns out to be the same as your prediction. And yes different chapters will give different words so this could be repeated with a different outcome. Effect Four = The volunteer selects any chapter, each chapter contains a letter written on a certain month of the year, they look at this and project the month of year to you and you tell them what it is (or predicted it beforehand) and yes diffferent chapters give different months of the year so this could be repeated. Effect Five = The book is opened to one of the colour pictures within it, the volunteer is given a coin and told to drop it freely onto the picture on the page. Your Prediction is shown or you pick up on what they project to you and your able to tell them what part of the picture the coin landed on and describe it. Effect Six = They choose any of the various different colour pictures that are inside the book (a totally free choice) Each of the pictures has a title and you are able to tell them the name of the picture that they freely selected. Effect Seven = You tell the audience that you will attempt to project to them the first number mentioned in the story of the novel. You project a number mentally to the audience and when you show the book and reveal what the first number printed in the novels story is the audience are shocked that a large amount of them have picked up on the correct number. Effect Eight = You project a number to the audience telling them its the first date mentioned in the novel and once again they are amazed that a large amount (if not all of them) have picked up on the correct number. Effect Nine = You appear to randomly open the book on a chapter and say that you will project to them a number on that page. The audience are amazed when the number on that page is shown and a large amount of them have correctly picked up on it. Note = There are over half a dozen additonal “Advanced Professional” ideas and routines included in the instructions explaining other routines and effects that can be accomplished using this specially printed book. Also once you have read the instructions and closely examined the book in detail I can assure you that dozens of other ways of using the book in routines and other manners will jump into your mind. This is an ingeniously gimmicked Hardback Book with both colour and black and white illustrations within that is in incredibly good condition for its age. Whats even better is the Novel was genuinely released as a Novel to the general public (so it appears) and if you search Amazon or book stores for it, although now Rare and Out of Print, it does show up for sale as a collectors item (and without any mention of it being a special book test book) the astute mentalist will be able to use this fact to their advantage. The book has “Kisses” instead of “chapters” as its a Romance Novel, each “kiss” or “chapter” starts with a letter and then goes into the story again. There are so many possibilities of what you can do with this normal looking yet ingeniously faked book, its almost a complete act in itself. NOTE = There are on many occasions spares included for lots of the stuff mentioned above, such as tons of different coloured sharpie markers, spare envelopes and such, all the bits and bobs that are spares easily have a combined value of £10 to £20 alone! NOTE = In all cases all of the props are in practically Brand New Condition, having been used for a short tour of 24 shows only. And in all cases either the original instructions are included, or in many cases these may have been lost, and so full instruction is given (where relevant) on “The Mentalists CookBook” DVD’s that you will also be given or by way of Personal Instruction from Jonathan Royle when you come to pick all of this up in person from his home in Rochdale (Near Manchester). 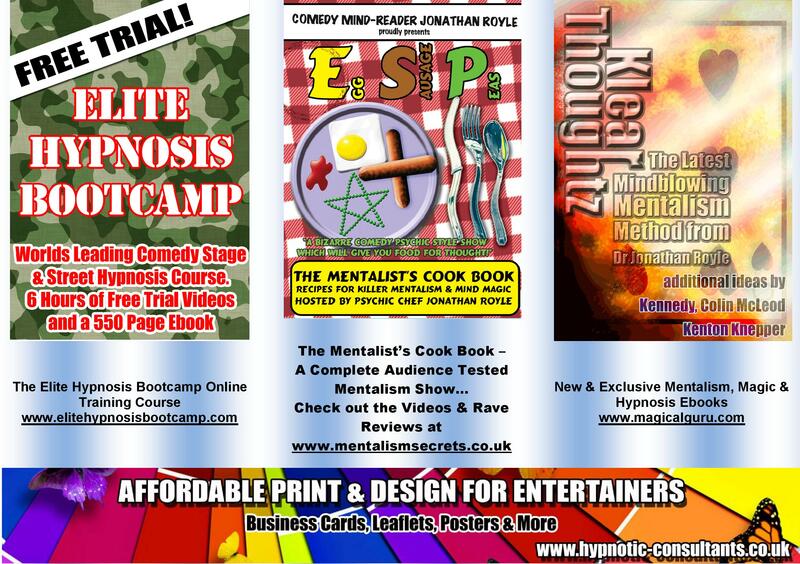 ADDITIONAL ITEM’S THAT YOU WILL ALSO BE GIVEN SO THAT YOU BOTH KNOW HOW TO DO EVERYTHING ABOVE AND ALSO SO YOU HAVE TON’S OF OTHER MENTALISM & HYPNOSIS ROUTINES AVAILABLE TO YOU – MANY OF WHICH CAN BE DONE USING VARIOUS OF THE PROPS IN THIS BUMPER PACKAGE.. REMEMBER = All items are in excellent condition. You also get all of the printed out and laminated music running orders and stage cue sheets and also packing cue sheets for the show, all music needed etc at no extra charge. And just think of how long it would take you in time to order all these items from various different dealers, plus the fact several are my own Unique Ideas and thus cannot be bought from any dealer and so would take you many hours to order all the bits and then make the props from scratch. Bidding on this package gives you the chance both to save many hours and hours of time building props, but also to save tons of money. PLACE YOR BID NOW – The Highest Offer I receive of over £925 before Midnight (UK GMT) on Saturday 10th November 2012 to my direct email of royle@magicalguru.com will be deemed the winner of this bumper package. NOTE = Please include a contact telephone number along with your bid, so that I may call the winning bidder on Sunday afternoon of 11th November 2012 as well as notifying them by email of their win. NOTE = If you have not heard from me by email and/or phone by 6pm (UK GMT) on Sunday 11th November then you can be sure that you were not the highest bidder and that somebody else has won. NOTE = All items, when packed will fit on half of the back seat of a small Fiesta Car so pretty much any car will be able to easily pick everything up. NOTE = Payment Must either be made by direct bank transfer in advance of picking the stuff up or in CASH upon collection. NOTE = Either way payment must be made to me in full within Seven days of this “Auction” ending as per date above and all Items must be picked up from my home in Rochdale (OL12 6ST) – Greater Manchester (England) at the Buyers own expense within 14 days maximum of winning the auction.